No, I haven’t abandoned this blog so early on though friends have been lamenting the apparent short lifespans of blogs I have started previously. The past month (of pregnancy) went past in a haze as I rushed for days in a row to complete a number of larger orders of macarons. Though thankful for the support, I’m also aware that I had overexerted myself. I’m grateful to slow down now and start preparing for the arrival of the little tiger girl. The adrenalin rush that accompanied the incredulous amount of macaron baking has inspired me to toy around with flavours once again. Missing home from a few thousand kilometres away, simply smelling something familiar brings about smiles. 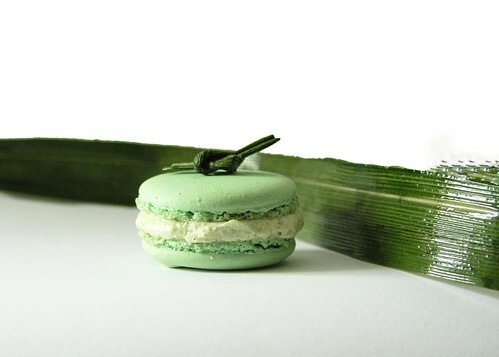 Pandan has always been a favourite flavour of mine. Wherever pandan appears as a flavour, it’ll be the default choice. The most memorable fusion dessert I have tasted was at Town Cafe (Fullerton Hotel). They served a divine pandan panna cotta. 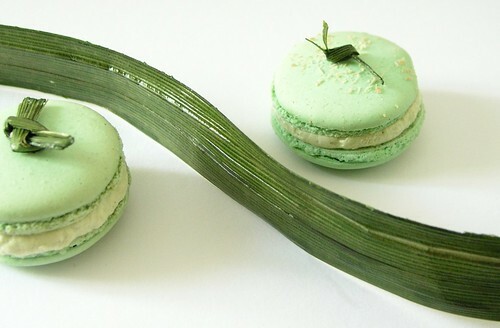 With that in mind, I set out to create a pandan coconut macaron. Forget pandan paste or flavour from bakery supply shops. I have tried all that they have to offer and sadly, I have yet to find one which is anywhere close to the original flavour from pandan leaves. The critical task, then, is to produce a suitable flavour paste for the buttercream. Pandan leaves were ground with water in a blender. Using a disposable soup bag, the juice was then extracted and heated. In order to thicken the juice, I added cornstarch. The resulting paste was potent – full flavoured but bitter. I thought that since the buttercream is sweet, I wouldn’t add sugar to the pandan paste lest the filling becomes unbearably sweet. Regretably, the bitterness couldn’t be disguised. Another portion of pandan paste was made again, this time, with sugar. The resulting buttercream filling tasted much better. The pandan fragrance is however light and lacking. I recall at this point that nyonya kueh recipes always pair pandan and coconut. They must complement each other in a special way. So, into the buttercream went a couple spoonfuls of dessicated coconut. Indeed, now the pandan flavour is more discernible. 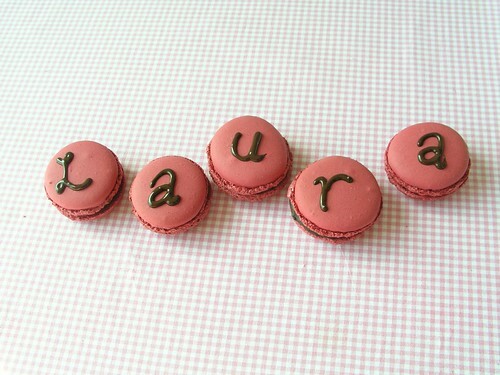 Having tasted Ladurée macarons recently, I’m further inspired to create a pandan coconut ganache the next time round. Their coconut macaron is full of bite and flavour; reminds me of coconut tarts from old-time bakeries. I can’t wait to experiment further with local flavours. Next on my mind – a mix reminiscent of chendol. Let’s see… pandan, coconut, gula melaka. Mmmm…. 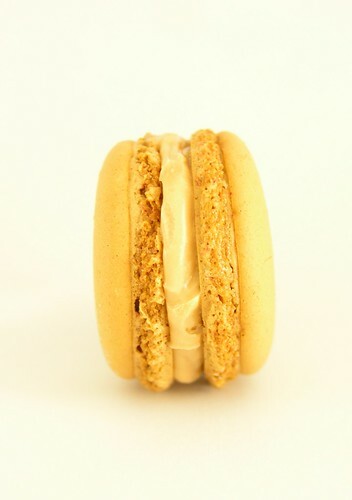 This Caramel Macaron or That Caramel Macaron ? 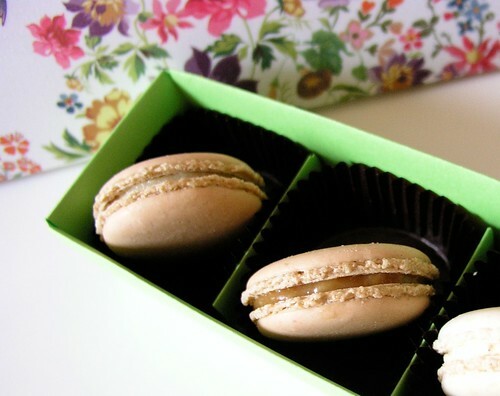 When I first offered macarons on DaWanda, I started off with creamy caramel macarons using PH’s recipe. They were relatively well-received but it seems most prefer caramel rather than caramel buttercream. Actually the only ingredient difference between the two is the amount of butter used. 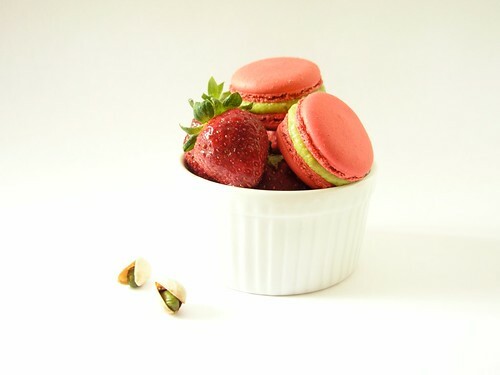 Nonetheless, the consistency of the macaron is altered significantly. As already known, macaron shells should be a little chewy. 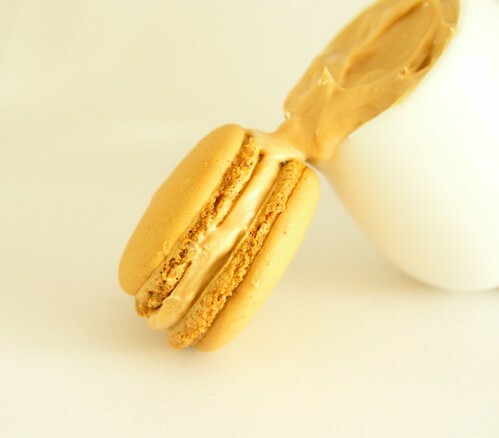 So baking caramel macarons on a low mac mojo day is definitely asking for trouble because chewy caramel and chewy macaron shells end up either in the trash or in a doggie’s mouth. I haven’t had problems with my caramel macarons until a customer gave me feedback last week that the ones he received were so hard, they made nice knocking noises on the tabletop but his doggies enjoyed them nonetheless. Good that I had some in my fridge and tested one promptly. Indeed, it was barely chewable. My guess is that it hasn’t been matured sufficiently. The one I tried the next day tasted much like the ones I have been sending out. I concede anyhow that caramel is not a favourite flavour of macarons for me because the combination is simply too sweet. But I do enjoy caramel a lot. Motivated by the failure of the most recent batch and a personal desire to make a yummy caramel macaron for self, I decided to go back to PH’s recipe of salted caramel. PH says in his book that a butter based cream brings out the taste of the caramelised sugar better (if my years of French didn’t fail me). I personally feel that this lighter version of caramel, made with more butter, makes it a more suitable filling for macarons because it is definitely not chewy and possibly lends more moisture to the macaron shells. Are macarons too glam to be filled with breakfast spreads? Or is it okay to normalise them with nutella and peanut butter? Whichever side of the macaron you are on, it seems these almond meringue shells are destined to make anyone who has a sweet tooth happy. Some time back, a customer who took the leap of faith from macarons of chocolate, to pistachio, to salted caramel asked for some macarons of licorice. I know somehow it will eventually happen; getting a request for a flavour which I personally abhor. Nonetheless, flavour experiments are always exciting. I decided that I would stick to buttercream as the filling and attempt to ‘licorise’ it. After some research on the internet, I found a website that sells everything and anything licorice and bought a sampler bottle of licorice powder. For the uninitiated, licorice is a flavouring extracted from a root and thus licorice powder is light brown and not black in colour. The pitch black colour of licorice candies is the result of the usage of molasses and most probably food colouring. Nonetheless, the colour association is now age-old and to keep to the tradition, I baked some really dark brown, almost black macaron shells. The buttercream was simply whipped with the licorice powder for the filling. A generous amount of licorice powder was added to the buttercream and the taste made me cringe and simulated a hypothetical heart seizure but it was probably necessary so that the licorice flavour is brought out in the final macaron creation. 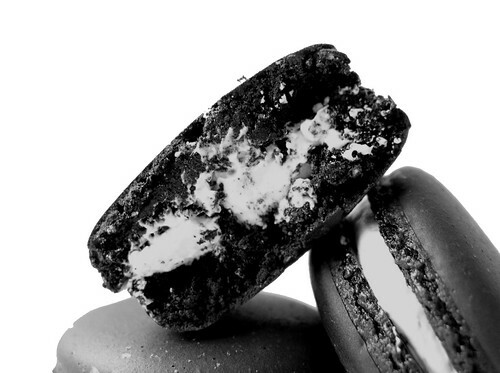 Even if I can’t decide whether macarons should remain haute couture, I know one thing for sure – I hate lame macarons. If the dark chocolate was supposedly infused with the finest of Earl Grey leaves, I shouldn’t have to be left wondering, “Hmmm…did the lady pack the wrong flavour?” Not to mention that I paid 2,45SGD for one. Now, I await the verdict of these pitch black sweeties from a bona fide licorice lover. Got a request to bake a whole bunch of macarons for her children’s birthday party last week. I decided to spruce a couple of macarons up a bit to make the little ones smile. Monograming is not difficult at all. Just melt some baking chocolate either in the microwave or over a water bath and pipe using a very fine nozzle. I used Wilton No. 1.